The Kitchel Wilderness is an almost 600-acre block within Algonquin State Forest (2545 acres) in Colebrook, northwestern Connecticut USA. It is a state-designated Natural Area Preserve (CGS Section 23-5a) located within of one of the largest and most pristine protected forest blocks in Southern New England. The Kitchel Wilderness harbors many rare, threatened, and endangered plants and animals. In a 2001 inventory, Botanist William Moorhead found 72 plant species in 55 community types within the designated block. It is an extraordinary place and a forest that has not been manipulated in a any way for many decades. Large trees, complex coarse woody debris, a thickening forest floor, streams, and robust natural disturbance processes drive the ecosystem. 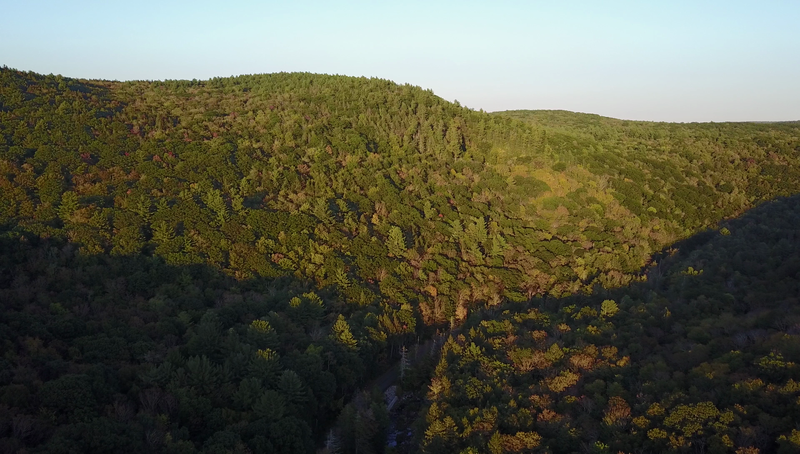 Here is a sunset video that captures the western reach of the Kitchell Wilderness before turning west to view northwestern Colebrook and northeastern Norfolk. These are the southern Berkshires, rising up from the relative flatlands of the Central Valley. The flight was a quick automated mission using the DJI Mavic and Litchi flight management software. Previous articleEdward Abbey: Thus Far and No Further.